National Brownie Day is this week (December 8th), and while regular brownies are good, this over-the-top recipe is extra special for this time of year. Make these tree-shaped treats for your next holiday party or even just for yourself (no shame). And did we mention this recipe is also gluten-free? Bonus! 1. Preheat oven to 350° F and lightly grease a square or rectangular baking pan. 2. In a large bowl, mix the oat and coconut flour, sugar, baking soda and cocoa. 3. In another bowl, beat eggs and add Greek yogurt, coffee, butter and vanilla and then add to the dry ingredients. Add milk if batter is too thick. 4. Pour batter into tin and bake for about 25 minutes. 5. Leave in pan for 10 minutes and then place in the refrigerator until brownies start to harden. 6. Remove brownies and cut them into triangle shapes. 7. Melt white chocolate and break the hooks off candy canes, then crush them. Save the candy cane stems. 8. Gently push the candy cane sticks into the brownies and drizzle with white chocolate. 9. 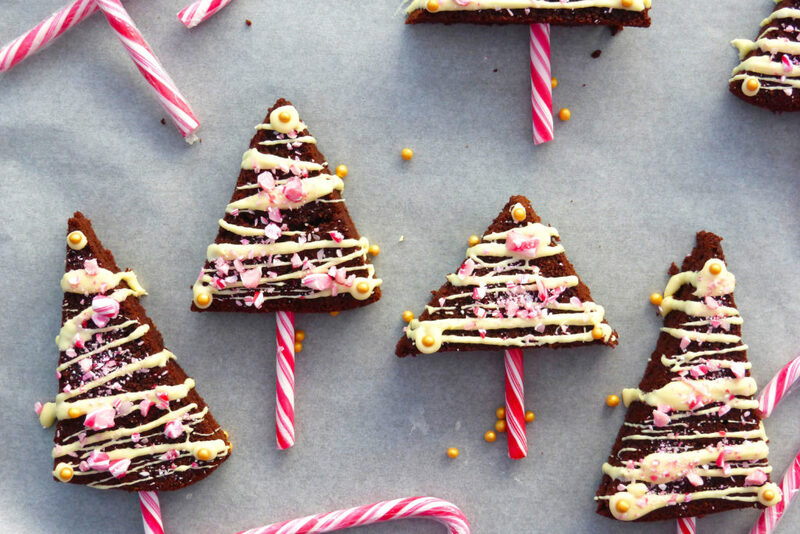 Finish off your brownie trees with the crushed candy canes. Pro tip: Take it a step further and add Christmas sprinkles. Would you try this gluten-free brownie recipe?